I have a weird sort of weakness for show-biz memoirs and biographies. I don’t read many of them, but I find myself wanting to read them all. I have no idea why because almost every book of this type disappoints me—the writing isn’t good, the information isn’t new, there’s too much gossip and not enough insight, and so on. But still, these books are a guilty pleasure that I indulge in from time to time. I hoped Born Standing Up would be a better than average memoir. 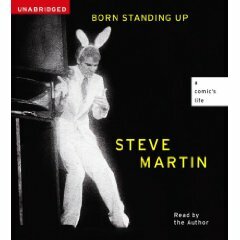 Steve Martin, after all, has done some actual writing, and I’d read some good reviews. Listening to the audiobook read by Martin himself seemed like it could be especially enjoyable because he could put in the same inflection he used in his bits, making it funnier than it would be in print. So the formula here seems to be a good one. Unfortunately, Born Standing Up doesn’t quite live up to its potential. It’s simply another average Hollywood memoir with an episodic narrative and an unfortunate amount of name-dropping. And Martin simply doesn’t bring the funny. Just a couple of chuckles that weren’t memorable enough for me to be able to recollect now and share with you. I did appreciate how Martin is generally not gossipy and never mean-spirited, and some of the material on how he built his act is interesting. If you like Hollywood memoirs and you’re at all interested in Martin’s early comedy or comedy of the 1960s and 1970s in general, Martin’s recollections of his early career will hold some interest. However, I didn’t find that it rose above the pack enough to make it worth seeking out if you’re not a fan of this type of memoir or if you aren’t interested in Martin’s comedy. I’m not sorry I read it, but I wouldn’t have been sorry to miss it either. This entry was posted in Audiobooks, Biography, Nonfiction. Bookmark the permalink. I never understand why people complain about name-dropping in a Hollywood memoir. Who else would they talk about? They’re surrounded by celebrities in their work and their social life and honestly – it’s why people buy the book! That said, I agree with the rest of your assessment. I enjoyed the stories about how he built his career more from determination than from some special gift. It made good commute listening, but it wasn’t nearly as good as Anything Goes by John Barrowman. LisaLynne: You make a good point regarding the name-dropping. It’s true that any memoir of this type would of necessity include plenty of famous names, and this book would feel incomplete without Johnny Carson and the performers from SNL. I think in this case, I was bothered when it seemed irrelevant to his career. The mentions of Stormie Sherk Omartian’s later fame as a Christian writer and John Frankenheimer’s stealing his girlfriend come to mind. Then again, some would feel the story is incomplete without this kind of personal stuff—it just wasn’t what I was reading the book for.